I think it's awesome, and the fact that it was her's would be enough for anyone to love. I don't have any "quilty" hand-me-downs like that. Lucky you. Oh Gene, that is wonderful! I didn't even know my grammas 'cause they both died young. What a treasure that is, and brings you much joy! Wow, what a treasure! She did not make it to be art, but it is. How very lucky you are to have something so special. I wish I had something made by one of my ancestors. Thanks for sharing that with us. 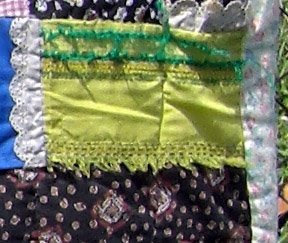 I like the colors she used, too......and I'm sure it took her awhile to gather the recycled fabrics she used in that quilt. What a nice memory that you can identify some of them!!! 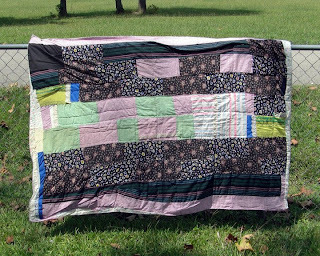 It is amazing how much a quilt like that can mean. 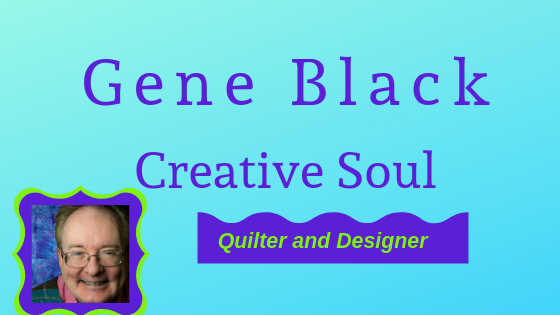 We have so many great tools now and they used what they had handy and the quilts were made for a purpose. So wonderful to have something of your grandmother that means so much! Things from my grandmother are some of my most treasured possessions. I have a number of her pieces of costume jewellery, some of her dishes and one quilt that was made by her and the ladies of the community. The quilt is not quilted - (it has stitcheries as our Aussie friends would call them) done by each lady of the community. It was done on muslin or feedsack material. I want to put a back on it to make it more durable. I think that your grandmother's quilt is beautiful and unique. I can see why it is a most treasured gift.